Theatre/-biomechanics "break" the rules of life for theatre ! In basic it is the appropriate and organic change of movement skills for using on stage. Physical rules like space noticing, rhythm, time, dynamics & expression are fixing contra points. 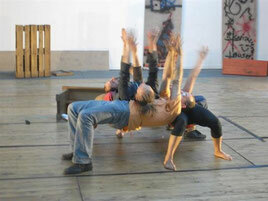 Target is to develop a high level of physical awareness on stage.